Even as a software developer, I'm still ocassionally surprised when events remind me that Spolsky's Law of Leaky Abstractions applies to hardware as much as to software. 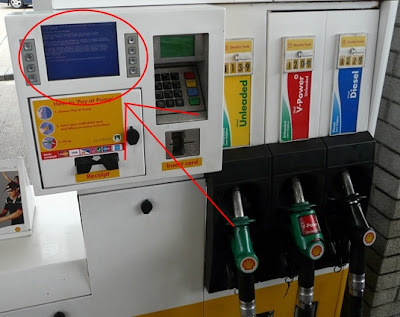 Any non-technical motorist who peered at the tiny writing on that blue screen and read "DRIVER_ERQL_NOT_LESS_OR_EQUAL" would surely feeel that he's being blamed for the failure, but what did he do wrong? Sounds like he failed some important existential test. I'm clearly not the only one who enjoys spotting BSODs in the wild: Miguel Carrasco has put together a Blue Screen of Death Top Ten. And on Gizmodo they have a snapshot of a BSOD that appeared in the Stadium during the Opening Ceremony at the 2008 Olympic games. Haha, yeah. You should have played dumb and went in and asked, angrily, why the gas pump was blaming you for something. I've seen my share of those too, though. Digital ticket dispensers are being put aboard busses here in Denmark, and I've seen a blue screen on that one. I've seen one in an airport over here, which wasn't particularly comforting, since I was flying out of there, and even in my school on a large LCD in the lobby that contains daily news for students.